As in, as measured by the broadest, most-inclusive data, the US stock market has never been as expensive as it is right now. Using the Wilshire 5000, which includes the market cap of the vast majority of all publicly traded US stocks, is a more accurate barometer of total stock market cap than the strange, Fed-created input of “”Nonfinancial corporate business; corporate equities; liability, Level” (got that?) that the traditional Buffett Indicator employs. We’ve used the St. Louis Federal Reserve’s FRED repository as the source for the stock index numerator (WILL5000PRFC). The Wilshire Index is a more intuitive broad metric of the market than the Fed’s rather esoteric “Nonfinancial corporate business; corporate equities; liability, Level”. This Buffett variant is also at its interim high. In a February 27 interview with CNBC, Warren Buffet expressed his view that the stock market is “on the cheap side”. His opinion seems to imply that buying into the market is inexpensive. 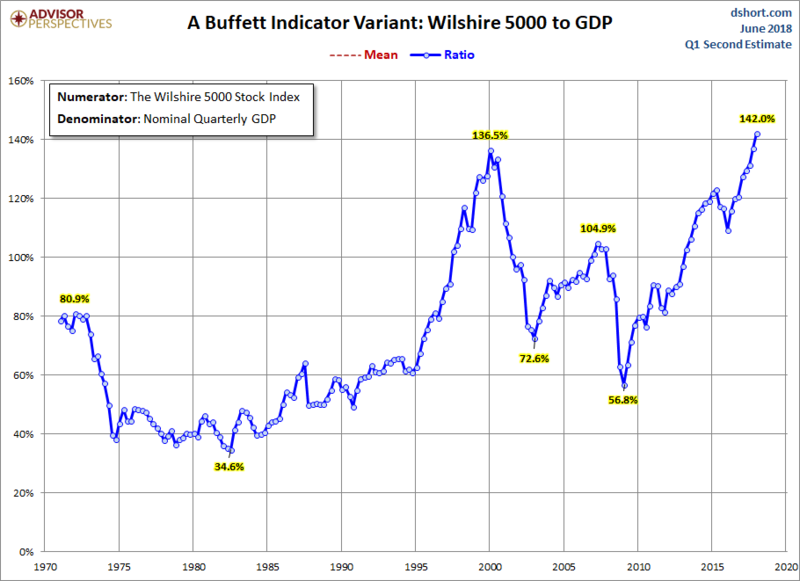 However, both the “Buffett Index” and the Wilshire 5000 variant suggest that today’s market remains at lofty valuations.